Madeline Stuart down syndrome model, defies the odds. 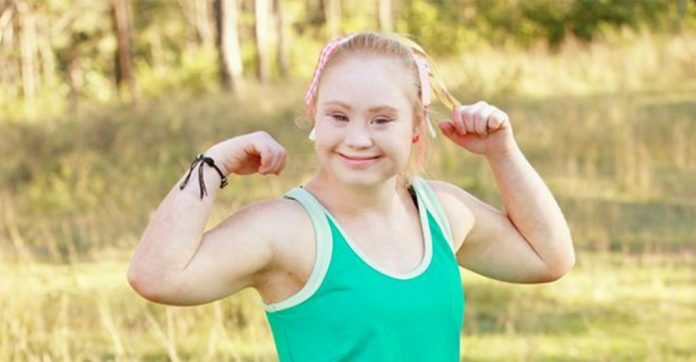 A Brisbane model with Down syndrome has defied the odds and is set to return to the runway after doctors said she would likely die following open heart surgery. Madeline Stuart, 22, will officially hit the catwalk in March after spending 26 days at The Prince Charles Hospital following a procedure to repair a damaged heart valve. The international model was admitted to hospital in December after her Mitral valve became dangerously enlarged, which sent her into heart failure. ‘Tomorrow morning I will have open heart surgery to hopefully repair my Mitral valve that has reached a 4 out of 4 defect,’ the model wrote on Instagram at the time. Her mum, Rosanne, recalled the devastating moment when doctors told her Madeline ‘wouldn’t make it through the night’, The Courier Mail reported. She said doctors broke the news when they were unable to regulate Madeline’s heart rate, which skyrocketed to about 250 beats per minute a week after the operation. The following days were harrowing for Rosanne, who waited patiently as doctors attempted to stabilise Madeline’s erratic heart rhythm. Madeline was doing amazing but then she needed to be taken to intensive care, at which point doctors told Rosanne her daughter might not make it through the night. Rosanne said watching Madeline struggle to breathe in an almost unconscious state and then cry out because she was so terrified was unbearable. Incredibly, after 26 days – 11 of which were in intensive care – Madeline made a full recovery after undergoing cardioversion, a procedure that restores normal rhythm. ‘I’ve spent every night of her life going to bed worrying about her heart and now I don’t have to. To know it is repaired, I feel like I’ve won the Lotto,’ Rosanne said. Following the life-saving procedure, doctors said it’s unlikely Madeline will need to undergo heart surgery again, which was a welcomed relief for Rosanne. Madeline is now back at the home and attending the gym regularly, where she is undertaking a cardio rehabilitation program ahead of a busy modelling schedule. She will also be heading out on the road in March, appearing as part of a special breakfast panel and meet and greet in Brisbane, Sydney, Canberra and Melbourne. Madeline, who has walked in more than 100 fashion shows around the world, is also raring to hit the runway again after being forced to cancel contracts for the surgery. Rosanne said Madeline was always a ‘pocket rocket’ before the surgery, so she expects that she will be doing some really big things this year. ‘I wanted her to be this strong, independent woman and I’m so proud of her. I think she will still be doing this (modelling) when she is 35,’ she said.